Indian Council of Agricultural Research Meghalaya Recruitment 2019 March :- Hello everyone. Welcome to North East India's No. 1 Job Portal NeCareer.com . 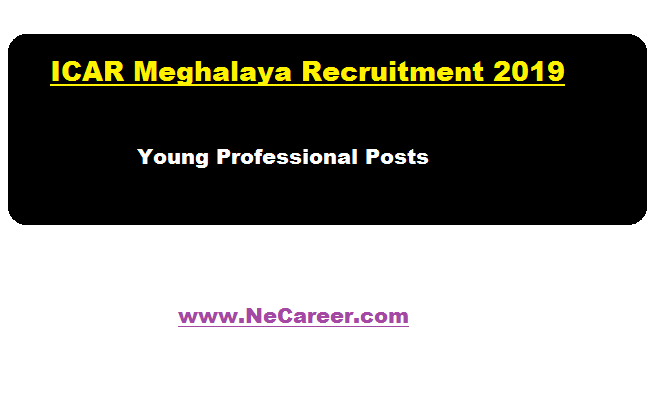 In this post we are going to mention about a new job vacancy in the state of Meghalaya in March 2019. Indian Council of Agricultural Research Complex for NEH Region, Umiam , Meghalaya has published a recruitment notification in March 2019. According to the ICAR Meghalaya Recruitment, Indian Council of Agricultural Research Complex invites candidates for walk-in interview to recruit 1 (one) no of Young Professional-I and 1 (one) no Young Professional-II on an ad-hoc basis. You can find details of the vacancy in below section. Educational Qualification : A candidate must have First class Master’s degree in Biochemistry/Biotechnology/ Molecular Biology. Age limit:- 35 years (5 years relaxation for SC/ST/OBC and women candidates as per ICAR rules). Experience : Candidate must have 1 year experience in Plant Molecular Biology techniques/ Plant Tissue culture/ Genetic Transformation. Candidates will have to appear in walk-in interview to be held on ICAR Research Complex for NEH Region , Meghalaya. The candidates who wish to attend the walk-in interview are requested to bring with them five copies of the CV with two sets attested photo copy of documents. Also, the candidates should bring the original documents such as degree certificates, marks sheets, publications, thesis, experience certificate etc. for verification. 2. The period and duration of the scheme is tentative and the same may change. 3.The person employed will have no right to claim employment or engagement in ICAR at the end of the contract period. 5. Persons already in employment should bring “No Objection Certificate” from their present employer. 6. The decision of the Director of this Institute will be final and binding in all aspects. In case of any disputes, it will be resolved within the jurisdiction of Court only.